Dennis Porter has been quick sketching brides, grooms, family members and guests at wedding receptions for 40+ years. 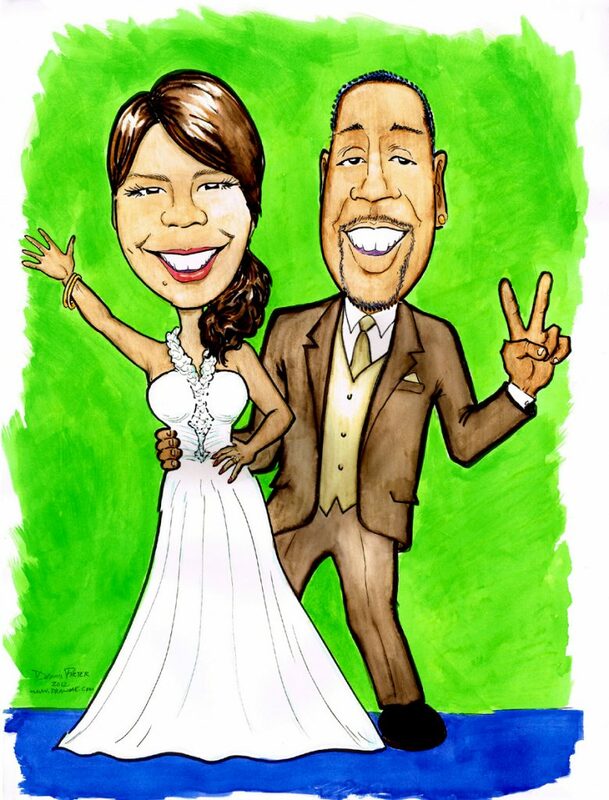 Caricatures are a gift your guests will never forget. Thrill your crowd with personal sketches — done as quickly as two minutes a person — with fun touches and amazing resemblances. Call Now! The bride and groom were all smiles at their beautiful wedding celebration. Thank you, thank you, thank you for drawing at our wedding. You were an absolute hit! Everyone raved about how much they loved their drawings and what a treat you were to be around, even after hours (and hours!) of working… The entire day was magical and you were the icing on the cake (wedding cake, that is).” -Seth & Brandi T.
Dennis drew for six straight hours and everyone had a terrific time at Seth & Brandi’s wedding reception. Dennis was utterly professional the entire time, keeping things upbeat, fun, and entertaining. Sounds like something you might be interested in? Weddings book quickly so please call now to secure your date and hours. Produced in Dennis’ studio, these are large full color pieces drawn from photos in advance of the big day. BEFORE THE WEDDING: Get One of THESE! Hand drawn from photos, long before the big day. 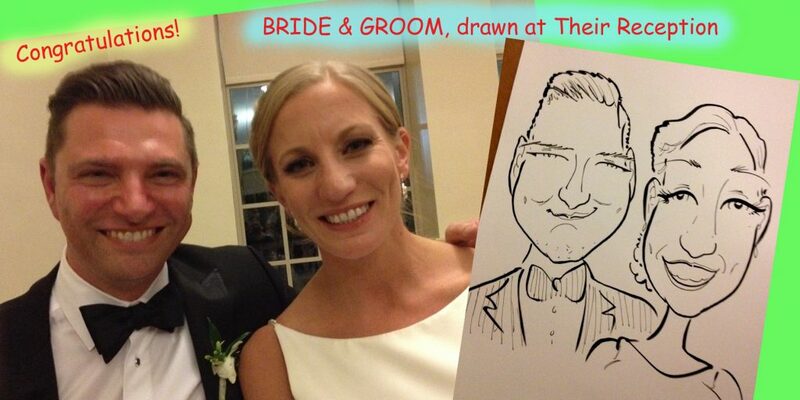 The sketches can Be Sign-in-Boards at the Wedding or Reception venues. Guests often sign the matboard around the art to create unique mementos of the Wedding Day. The couple will always remember! Get Prices — Email now! Live entertainment is a unique addition for a great wedding.